Margaret Isabel Freeman of Neepawa, Manitoba passed away January 13th 2019 at Country Meadows, Neepawa at the age of 93 years. Margaret , the daughter of Joyce and Ernest Brydon, was born at home on the family farm at Arden, Manitoba. Margaret went to school at Oakdale, Manitoba and later in Franklin, Manitoba , where she met her husband Ernest Freeman. She worked at Freeman’s General Store with her husband Ernie. In 1971 the Franklin store was closed and Marg and Ernie moved to Neepawa. Ernie worked at the Co-op store and Marg worked at Mars Fashions. 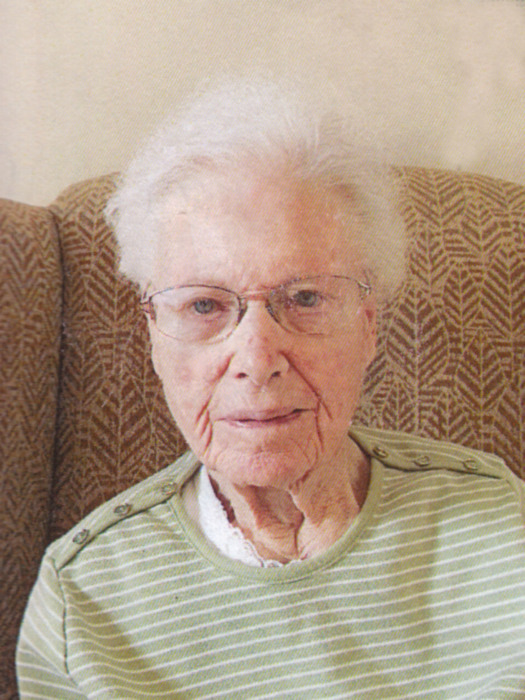 Margaret enjoyed gardening, attending church, dancing, and being surrounded by family. Margaret was predeceased by her husband Ernest in 1982, daughter Beverley in 2005 and daughter in-law Lorraine in 2005. She is survived by son Keith Freeman. She is also survived by brothers Bob Brydon and Allen Brydon and sisters Dorris Meadows and Norma (Fred) Watson. Margaret has four grandchildren, Jennifer, Jacqueline, Keith (Tanya), and Kristin (Chris) and one great-grandchild Zander. She also leaves behind a multitude of nieces and nephews. The Funeral Service held January 17th 2019 at the Neepawa United Church, at 2:00 p.m. with Wendy Denbow officiating. Internment at Riverside Cemetery, Neepawa, Manitoba. Pallbearers are: Keith Freeman, Chris Jordens, Garnet Vinnell, James Hunkin, Corbin Krysko, Keenan Krysko. White’s Funeral Home will be in care of arrangements. Donations in Margaret’s memory can be made to Country Meadows or Palliative Care.